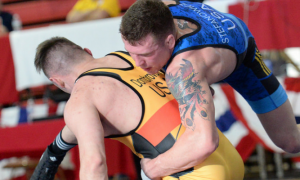 OVER the winter, multi-time National Team member and 2014 World Military Championships silver medalist Jon Anderson (87 kg, Army/WCAP) deployed to Afghanistan along with the 2nd Brigade 4th Infantry Division. The news caused quite a stir in the USA Greco-Roman community, as well as for the general wrestling populous around the country. Anderson — well-liked, highly-respected, and a perennial contender to make the US World Team — was also coming off of one of the more impressive feats of his career. After piecing together his training for the 2017 World Team Trials while on Temporary Duty last winter, Anderson put together an inspired run to earn a place on the National Team for the sixth consecutive season. 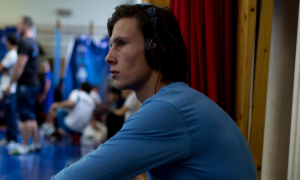 It wasn’t the highest placing he had ever enjoyed, but given how well he competed in conjunction with the lack of actual, honest-to-goodness high-level mat time beforehand, the overall performance still turned some heads. That his next time out resulted in a stout third-place effort at the November Dave Schultz Memorial only served to pump up the Team Anderson hype train even more. Anderson had seemed to figure some things out from an offensive standpoint. Always a fearsome brawler, the WCAP rep was beginning to convert his pressure-based style into points at an increasing rate. To the uninitiated, that might not appear to be a big deal, but in a sport where scoring is often at a premium, athletes who can force-feed points tend to stand out. Anderson’s tireless approach centering around constant attacks looked to be in full bloom, resulting in observers having no choice but to peg him as an even more dangerous threat to the crown than he was previously. Plus, he had time on his side. The 2018 World Team Trials was way off in the distance, a whopping seven-and-a-half months after that bronze at the Schultz last November. Surely, he could use that space to further sharpen his skill-set in advance of the nation’s most important annual tournament. But then the news came. To be fair about the whole thing, Anderson was happy about it. Not happy about being away from his wife, Molly, or his two boys, Teddy and Mac. Not happy about having to accept the disappearance of an entire competitive season and a chance to make the 2018 World Team. It’s just, this is what he does. He’s not Jon Anderson — Greco-Roman athlete; he’s Major Jon Anderson — soldier, servant, husband, father. He loves wrestling. That’s something he does, too. But it comes after the role of soldier and leader, and he embraces every blessed opportunity that comes his way to fill said role. Before Major Anderson left for Afghanistan he made it clear that he would still endeavor to keep in shape whilst on deployment. That, of course, was not surprising to hear. The working-out end of things wasn’t expected to present too much of an issue for Anderson. No, it’s not like Afghanistan was going to offer the same Greco training environment as WCAP — but there were going to be Army Combatives sessions for Anderson to instruct. 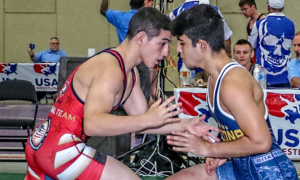 He could “Go Greco” before, during, or in between those practices to stay current, as well. Anderson always makes a point out of being adaptive. It is a concept he cannot help but emphasize, especially when discussing his dual career path as an Army officer and Greco-Roman athlete. That word, or a variation of it, is used by him a lot. Sure enough, Anderson wasn’t in Afghanistan very long when he touched base with this writer to share the image below, which (with his permission) I promptly shot out on social media. The text in the parens felt necessary to add. The way I figured it, tear-away tumble mats, or whatever they’re even called, were not suitable for Army Combatives, Greco-Roman wrestling, or any other combat sport, certainly not on an ongoing basis. Are they fine in a pinch? Probably. But not over the course of however many months Anderson was going to be away. And since a) Anderson is a valued member of the Greco-Roman family; and b) service members who risk their lives on a daily basis deserve to work out on mats that aren’t going to lead to otherwise avoidable injuries, at the very least, I hoped cramming that one little sentence in towards the end might provide some traction. Luckily, it did. And someone stepped up. That’s where the real story starts. His name is Kevin Roberts. 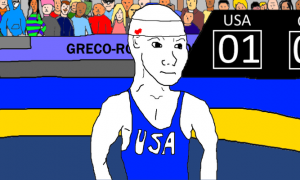 If you follow wrestling in the United States, chances are high you know who he is. A former two-time NCAA All-American at Oregon before beginning a coaching career that now spans over two decades, Roberts knows the value of what an adequate mat surface has to offer. He saw the photo of Anderson and his soldiers online, and it made an instant impression that motivated him to get involved. The reason why Roberts was in a position to help is because starting late last year, he has been working as an independent sales representative for Resilite, the mat manufacturer synonymous with American wrestling that first opened up shop nearly 60 years ago and boasts the largest such business in the world today. Fortuitous circumstances. However, Roberts originally set out to raise the cash himself and in order to do so, he was willing to shake a few trees. What dropped from the branches wound up being a very pleasant surprise. The fact that the biggest question for Roberts went from How can I raise the money? to What size mat does Anderson need? in that fast of a turnaround speaks not only to Resilite swooping in to save the day, but how ardently the greater wrestling community sticks together when tribalism and politics don’t mussy up the equation. 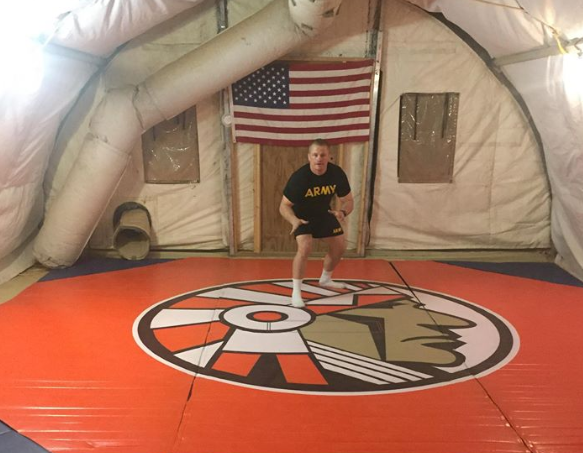 A soldier who is also a superb wrestler serving overseas needed a mat. Within a couple of phone calls, that problem was solved. Proceeding details blurred past. Roberts, now coordinating directly with Anderson, found out that the ideal mat size came in at 20×20. Back in Pennsylvania, Gilbert checked in to confirm they were good to go, telling Roberts, “I’ve got a mat and it’s the perfect size.” From there, the wheels were in motion, literally. SHIPPING was the only obvious holdup. 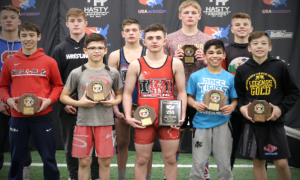 Resilite transported the mat to Fort Carson in Colorado but after that it had to be flown to Afghanistan. That’s not exactly like ordering from Amazon Prime and receiving a fresh pair of slippers on your doorstep two days later. The shipping process of a very large item to an APO, in a war-torn corner of the world no less, is both lengthy and cumbersome. On top of all that, it can be extraordinarily expensive. This is when Anderson came up with a creative alternative, and hardly a surprising one if you know him even a little bit. It’s worth noting that this process took a while. A long while. Roundabout April 10th is when the mat left Resilite in Pennsylvania. It arrived in Afghanistan on July 30th. But even when it touched down in-country, there was still one more hurdle needing to be cleared — and was — thanks to a resourceful officer who apparently shares Anderson’s affinity for adapting. Your wrestling mat may be cool. But is it strapped-to-an-ammunition-crate cool? Probably not. Anderson’s responsibilities as a combat officer for the US Army in Afghanistan are far-reaching. He is a leader — a real leader. An educator. A mission planner, a soldier, a coach. A brother. None of what he or any of the other men and women in his battalion are tasked with could be mistaken for the rather mundane realities of life at home, a life they surely miss at the moment. It’s part of what makes uniting for Combatives practices or impromptu training sessions so important. They get to burn off energy, de-stress, and lock into a productive activity that improves combat readiness as well as mood. Everyone stood to benefit from a new mat, not just Anderson. That is the main reason why he was so elated when it finally made its entrance into the barracks. 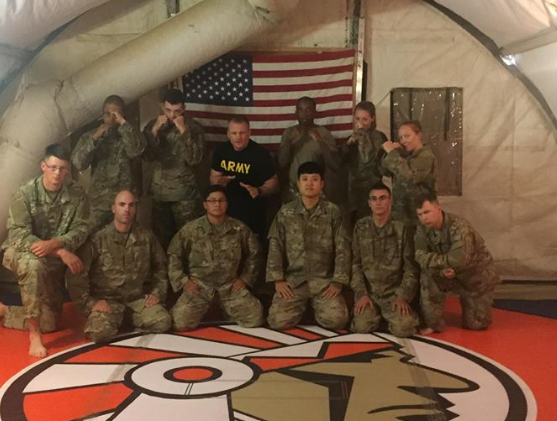 Anderson shortly after the new Resilite wrestling mat was rolled out in Afghanistan. Anderson didn’t take too long to send out word that the mat had successfully reached its destination. When he did, he included his own photos, that just like the first time back in early-April, caused Roberts to feel an emotional tug. Anderson and members of the 1st Battalion, 41st Infantry Regiment, 2nd Infantry Brigade Combat Team, 4th Infantry Division in Afghanistan — Summer 2018. 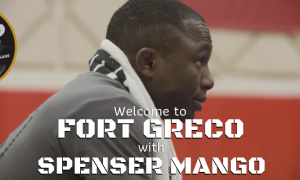 Anderson provides further insights on the mat, training in Afghanistan, and how he and his soldiers are continuing their mission. And as you will read, Anderson’s training has not slowed down since his deployment. 5PM: How often are you yourself able to get any training done? Is it sporadic or fairly regular? Jon Anderson: I train every day. Sometimes, I only have time for “QP”, or a “quick pump”, in our local compound with make-shift weights and equipment. However, even this is pretty effective because I grab three or four other soldiers and we all push each other to crush a work out in 20 minutes. I have been consistently wrestling three to four days a week with some former collegiate wrestlers, so it’s a pretty tough room. The new mat more than doubled our usable space and has allowed us to train much harder. I also run and lift at other times throughout the week. I am the strongest I have ever been in my life. I’ve hit personal records on bench, squat, and deadlift every month I have been out here. The timing of my workouts shift from day to day based on the pace of our combat operations, but I always find a way to accomplish my daily and weekly training goals. 5PM: I’m sure you were grateful just to have the gymnastics mats before this one arrived, but were those mats at all a problem for you in terms of impact, injury, and so forth? Anderson: Our soldiers are motivated, physically and mentally tough, and creative — especially when it comes to challenging each other and staying in good shape. The old mats that we had gave our soldiers an area to do this but it posed an increased risk because the mats were uneven and had gaps in between the seams. We actually had one soldier break his hand because of it and a couple of others sprained their ankles. We were definitely in need a better solution. Kevin Roberts came through for us big time! 5PM: Morale is vital for you, your men, and your mission. What does having a nice new mat to work on do for both you and your Combatives team? Anderson: These mats provide a dedicated space to train our warfighting skills. Combatives training is a way to enhance our warrior ethos and improve our ability to close with and destroy the enemy in combat. It directly builds confidence and increases resilience in our soldiers, as well. 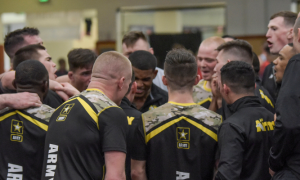 Over the past 30 days, 80+ soldiers earned their Combatives Level 1 Certification, which consisted of 40 hours of training in hand-to-hand combat skills and techniques. This directly contributes to their combat readiness and to the overall accomplishment of our mission here in Afghanistan. In addition to formal training, this mat space provides a great outlet to relieve stress, get in great shape, and to form bonds with fellow soldiers that will last a lifetime. 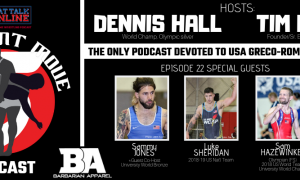 5PM: Now that the Trials are over and there are World Team camps and that process is in full swing, does it make you miss the sport more? Anderson: I am excited for Team USA and I am confident they will bring home some medals from the World Championships. I would say that I miss the chance to test myself in competition, but that is what I am doing every day out here. I love what I do. I have the honor of leading men and women in combat and I am laser-focused on the mission here. That doesn’t mean I never think about wrestling though; I think about it a lot actually. I think about technique that I need to work on and I create opportunities to improve it significantly out here. As a matter of fact, I’ve developed a pretty mean arm throw recently so keep your eyes open for that next year. More importantly though, I apply the determination, grit, and intensity that I have developed through the sport to overcome challenges our battalion faces and to help build a winning organization. My goal is to empower and equip my staff and the soldiers around me with tools that will enhance their performance and improve their ability to maintain composure in stressful situations. We have a “One team, One fight” mentality out here and our mantra is “Ready Now” for any situation that we might face. Similarly, in wrestling, you have to be focused in the moment and be prepared to perform at your best when it matters most. If you lose focus and make a mistake during a competition it will likely cost you the match. The price of a mistake during a deployment is much higher, though. There are no wrestle-backs in combat. The soldiers and leaders of 1st Battalion, 41st Infantry Regiment understand this and remain vigilant as they fight for freedom on a daily basis.